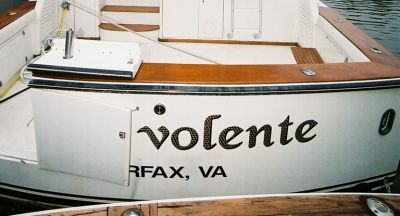 The transom is the boat's calling card. 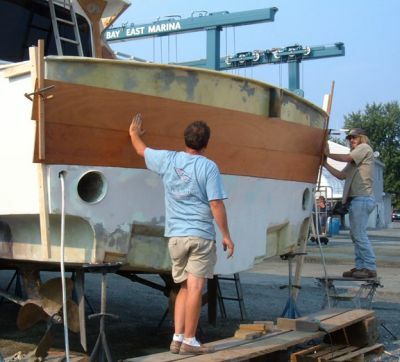 We feel a varnished mahogany transom, with the name and port of the boat, makes her a yacht. We clamped 2 x 3 planks. The plank is planed and waiting for a clamp for fitting. Dave and I are clamping the 2nd piece in place. This is the most Dave dances! 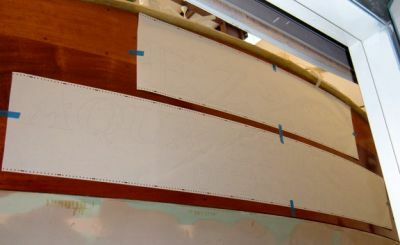 Transom on, trimmed and sanded down to 220. 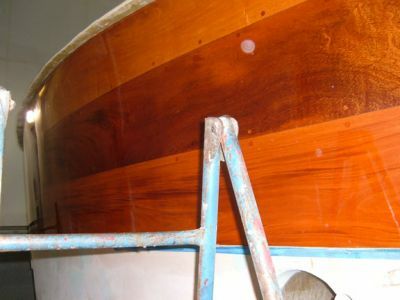 This is with 4 coats of Schooner Varnish. 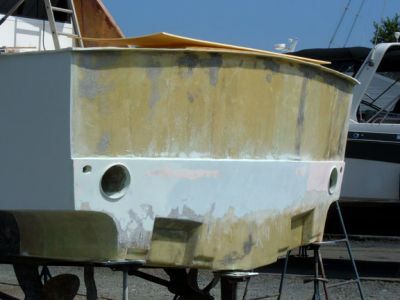 Sanding with 220 between each layer until no voids can be seen. Linda printed the name out in pencil for us to confirm size. 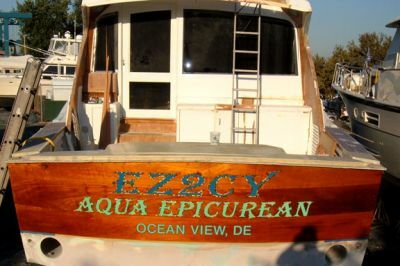 Unfortunately the pencil marks do not show up for the photo but you can take my word for it that the top paper says "EZ2CY" and the bottom paper says "AQUA EPICUREAN" with the home port of Ocean View, DL under it. 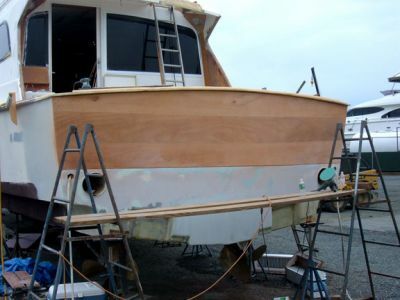 The boat takes up almost all of the shop so I couldn't get any further away to take the picture. 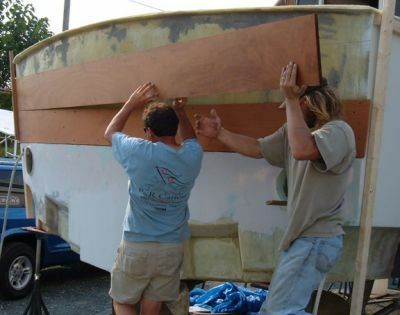 This photo shows how much room is still left on the transom. 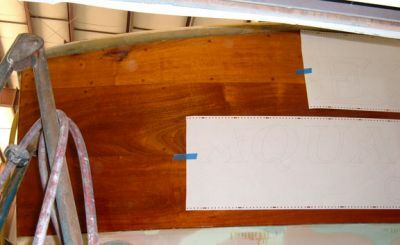 The gold leaf outline is ready for Linda to fill with color. 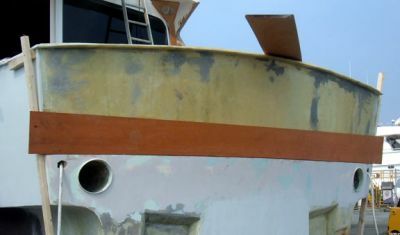 The home port stencil is also waiting for her brush. This process takes time and a steady hand. 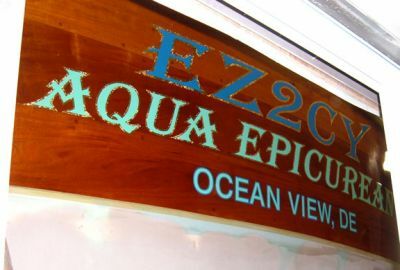 We wanted ocean colors throughout the boat as our theme. Wow! 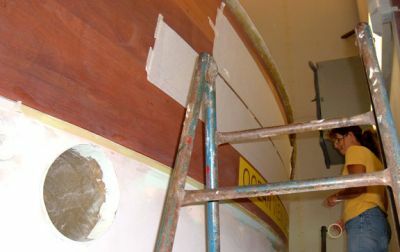 We now have to wait a day or two before laying a coat of varnish over this. 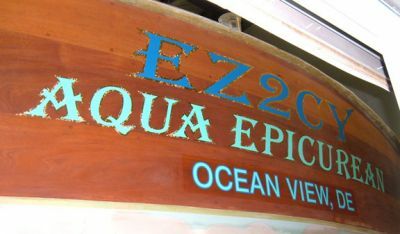 FACT: Aqua Epicurean and the home port are actually the same color. 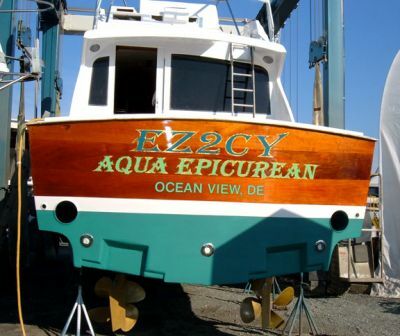 The home port is outlined in the same blue used for EZ2CY and now the aqua color looks "baby blue". 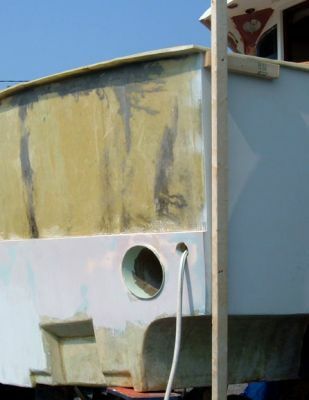 The aqua color will be used in the boot stripe adjacent to the transom, then a 1" white stripe, an approximate 2" blue stripe, and finally another 1" white with the "SEA Hawk" teal bottom paint to finish it all out. 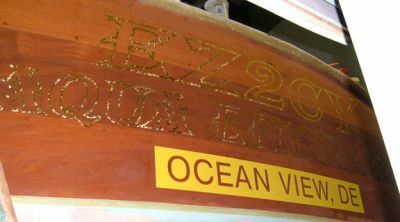 In this picture, there is only one coat of varnish over the name. 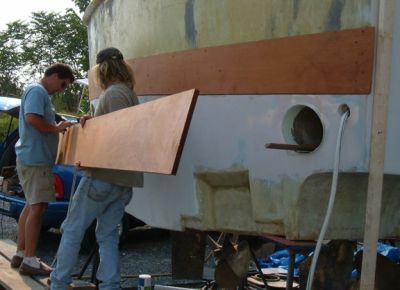 A full view of the transom when boat was moved outside for Anchor Bay's Party. 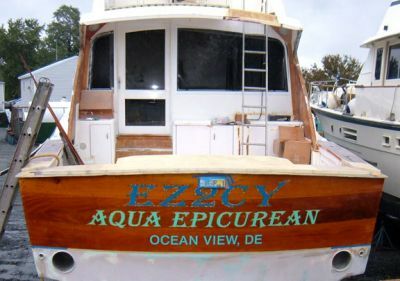 Only one coat of varnish is over the name. 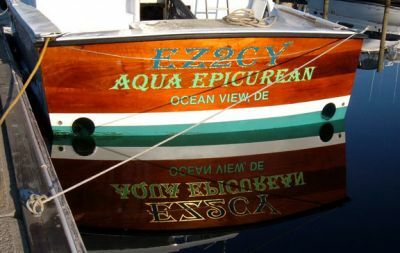 Three coats of varnish over the name. 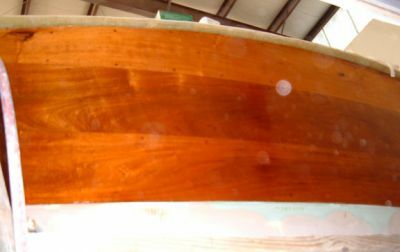 The transom has sixteen coats of varnish. About eight are over the name. 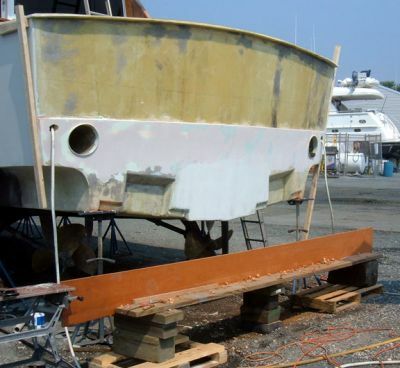 The line from port to starboard (over the EZ2CY portion) is the rope light from IMTRA that will be secured under the rub rail to shine on the transom. Show-off! 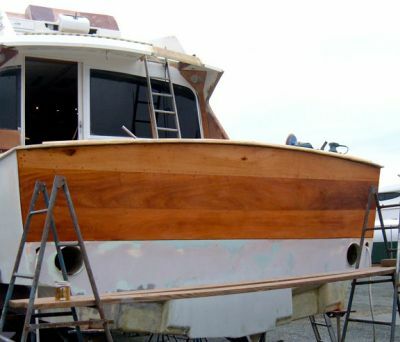 We will put more varnish on her in the spring.